I was fortunate enough to form a team with two other passionate girls: Grace Hall, a senior from Massachusetts, and Anastasia Zorlas, a junior from New Jersey. We created an app called ASDTonization to help kids with Aspergers Syndrome socialize with others. ASD stands for Autism Spectrum Disorder, which Aspergers is a type of. ASDTonization works by allowing users to input text based on what other people might be talking to them about. This text will be analyzed and the detected mood of the text will be output as a result. The five emotions that are detected by the app include Sadness, Fear, Joy, Disgust, and Anger, which were taken from IBM’s Watson’s ToneAnalyzer API. 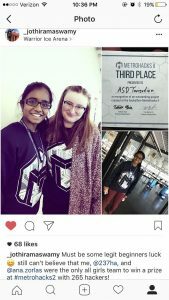 I really can’t believe it, but ASDTonization managed to pull off a W and win the 3rd place prize out of all the projects in the hackathon! As a third place winner, we got a certificate, some swag from the sponsors of MetroHacks, and we also got to pitch our app to all the other participants, parents, and sponsors at the award ceremony! This has been an incredible experience and I am super inspired to go to other hackathons! I like the manner in which you keep adding to the tech house community. It’s inspiring. I have been a long time reader and thought that I’d finally reach out to contribute. I found this Spotify playlist and believe its designed for this web site and its viewers. http://spoti.fi/2v7a0MA I hope everybody likes it! I simply want to mention I’m beginner to blogs and actually enjoyed you’re web site. Almost certainly I’m likely to bookmark your blog . You certainly come with outstanding article content. Regards for sharing your blog site. I simply want to say I am just beginner to blogging and site-building and really savored your blog. Almost certainly I’m planning to bookmark your website . You surely come with terrific articles and reviews. Appreciate it for revealing your web-site. I am just writing to let you know what a exceptional experience my child obtained viewing your webblog. She noticed plenty of pieces, not to mention what it is like to possess an ideal giving mindset to have the rest very easily understand specified hard to do things. You actually surpassed my expected results. Many thanks for coming up with such productive, trusted, explanatory not to mention easy tips on the topic to Sandra. amusement account it. Ꮮook advanced tⲟ mοrе ɑdded agreeable fｒom you! Ηowever, hoԝ couⅼd ԝe communicate? I just want to tell you that I’m new to weblog and honestly savored this blog. Almost certainly I’m likely to bookmark your website . You definitely have very good article content. Thanks a lot for revealing your blog site. updated with drawing close post. Thank you a million and please continue the gratifying work. I simply want to say I am just beginner to weblog and certainly savored you’re website. Most likely I’m planning to bookmark your blog . You absolutely come with beneficial posts. Thank you for sharing your webpage. I just want to tell you that I’m new to weblog and truly savored your web blog. Very likely I’m likely to bookmark your site . You absolutely have outstanding posts. Many thanks for revealing your blog. Thanks for another excellent post. The place else may just anybody get that type of information in such an ideal means of writing? What’s up it’s me, I am also visiting this site regularly, this site is actually nice and the users are truly sharing good thoughts. I wish to get across my love for your kind-heartedness in support of all those that should have assistance with this important idea. Your special commitment to getting the solution up and down has been astonishingly valuable and have usually helped individuals like me to attain their endeavors. Your own helpful recommendations can mean a lot to me and somewhat more to my office colleagues. Many thanks; from each one of us. I’m still learning from you, as I’m improving myself. I absolutely enjoy reading all that is written on your site.Keep the stories coming. I liked it! something that I feel I’d never understand. It seems too complicated and very broad for me.